Blackburn Rovers have pulled off their fourth foreign signing of the summer by bringing in young French midfielder Steven N'Zonzi. 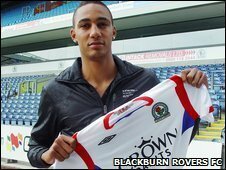 N'Zonzi, 20, who was with relegated French side Amiens last season, has signed a four-year deal at Ewood Park. Rovers have paid an undisclosed fee for N'Zonzi, who follows defenders Gael Givet and Lars Jacobsen and midfielder Elrio van Heerden to the club. Boss Sam Allardyce is still keen on Real Madrid's Ruud van Nistelrooy. Although N'Zonzi has represented France at youth team level, he only made his professional debut in April 2008. He played 35 times last season as his club were relegated from Ligue 2 but he is determined to be a success in England. "It is a big move for me and I am really pleased to have done it with Blackburn," he said. "I really want to do the best to improve my game, training every day with experienced players and give my best for the new challenge." N'Zonzi told Rovers World: "Every week in France we watch the Premier league, it is the top league in the world. "I am really excited to start the new season with a new club. I am looking forward to meeting my new team-mates."